Riding alongside the ocean, salt air blowing through your hair, sun setting over the dunes. It’s the stuff of fairytales. It also happens to be one of the lesser-known activities available to you and your family on Hatteras Island. Our beaches are the perfect spot for horseback riding, in fact, Hatteras Island was named one of the top 5 places in the country for horseback riding on the beach by Drive the Nation! 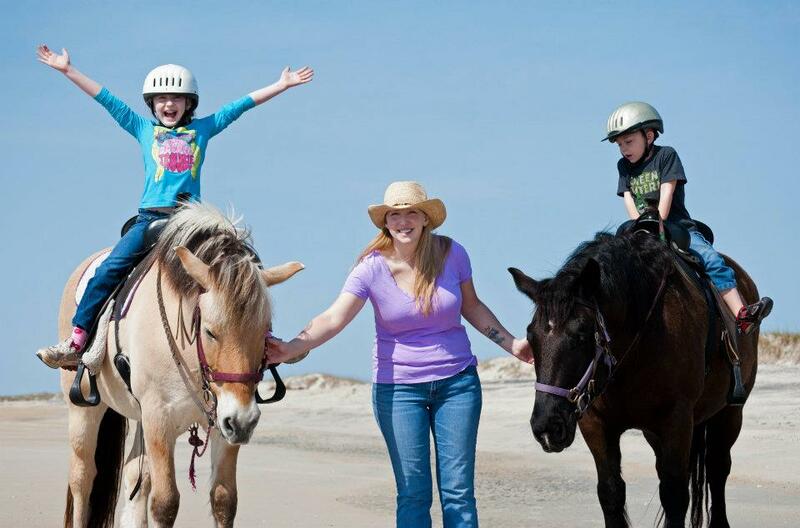 Hatteras Island Horseback Riding is open year-round and all of their riding is done on the beach in the Cape Hatteras National Seashore and Recreation Area. Since 2006 they have specialized in offering safe rides for families and those with very little horseback riding experience. For $190 total the whole family can enjoy the two horses at the beach for an hour. They also offer summer sunset rides and can accommodate those with special needs and all ages! Equine Adventures is located in Frisco and offers a two hour guided group trail ride through the maritime forest to the beach. Riders will enjoy a 45 minute beautiful trail ride through the woods, 30 minutes on the beach, and 45 minutes back through the woods to the barn. Rides are $120/per person in the summer and riders must be 10 years of age. All experience levels are welcome. Call or email to schedule this memorable event today!